In just three decades Clearwater has grown from a regional water solutions provider to one of the largest suppliers of water treatment, hygiene and air solutions, servicing major brands across the UK and Ireland. Clearwater has the widest national coverage of any provider within the industries in which it operates. They offer a comprehensive range of products and services to clients of all sizes, from single care homes to global brand names with multi-site facilities. Clearwater operate over 300 mobile workers, which cover a vast geographical area. Thus, communication and the ability to receive reports on completed work by field inspectors and engineers was proposing difficulties. In order to improve efficiency, Clearwater recognised a need to implement a robust, easy to use system that would capture the legionella information on client sites, then relay this information quickly and accurately. Furthermore, another key challenge faced by Clearwater was the laborious time spent on administration; writing up large, complex, reports such as Legionella Risk Assessments required substantial manual input. Clearwater’s dedicated teams deliver over 10,000 risk assessments per annum across all industries. Due to the substantial document size, Clearwater could not find an appropriate digital product that could handle the complexity of the form required. Clearwater’s engineers were stuck manually taking notes on paper, then transferring them to digital forms after the risk assessor had left site, thus duplicating valuable time and effort. Velappity is very flexible and facilitates the creation of large complex documents such as a Legionella risk assessment. The most suitable resolution is presented on an app for the engineers, accessible on both IOS and Android, which can produce a full template output document to fit the specific structure and format, as required by Clearwater. 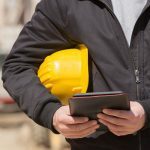 The mobile risk assessment app allows the field-based workforce to skilfully capture relevant data, as structured with appropriate question types, mandatory features and is also built for easy navigation. The intelligence of the forms app capabilities contains a responsive and astute platform; for example, if an operative was to add a particular asset type, the form is reactive to this and relevant questions are then produced. Once this is completed, a Legionella Risk Assessment can be formatted and generated for review and then sent on to clients. Utilising Velappity, has meant the time spent on admin has dramatically decreased, allowing the workforce to be on site more days and completing more jobs, thus showing a significant improvement in efficiency for Clearwater. Velappity allows us to create our own documents which can handle the complexity of our Legionella Risk Assessment to our specific requirements. The adoption and utilisation of this product has streamlined our processes and improved productivity.